Learn To #QuiltLikeABoss – Quilt Along with us! Today I am excited to announce that together with Rachel and Abby, we will be hosting a QuiltAlong, entitled Learn to #QuiltLikeABoss. We have heard many of you say that you’d love to make a quilt but for whatever reason haven’t done so yet. Since we all love quilting, and want you to love it just as much as we do, we are hoping to remedy the situation. Quilting can seem overwhelming – but compared to making a dress, you’ll be amazed how easy it can be (you’re sewing in 2D rather than 3D afterall). The hardest part is getting over the fear of starting. But in the wise words of Dr Seuss, Congratulations! Today is your Day! Over the next 5 months, with around 2-3 posts each week, we will be posting inspiration and information with the goal of guiding you through all the decisions required in making your dream quilt. We are considering the core audience to be people who are able to sew, but have not made a quilt before, however hopefully anybody will be able to use the information and join in. While we might put together some tutorials of our own, our focus will be more on introducing you to some of the vast quantity of information available online to quilters, and providing information to help you decide which information is best for you. Introduction (now until late-Jan): We will introduce the topic of Quilting, including what it is, why it’s awesome and what you can use quilts for. Choosing/Designing your Quilt (3 weeks – late-Jan until mid-Feb): We will provide you with some inspiration for quilt designs and share some tips for choosing designs and fabrics for your quilt. Patchwork – Making the Quilt Top (5 weeks – mid-Feb to mid-March): We will take you through how to successfully piece your quilt top, covering a variety of designs and methods. Quilting – Making it into a quilt (2 weeks – mid- to late-March): We will talk about the why and how of the actual quilting. Finishing it off (2 weeks – early- to mid-April): We will finish off our quilts; binding the edges and adding a label. Round-up (late-April to late-May): We will share our finished quilts, and will have a round-up post of your completed quilts on the 27th of May. 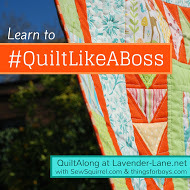 You can visit the #QuiltLikeABoss page at any time to find links to all the posts in the series. So, will you be joining in with our QuiltAlong? We look forward to seeing what you create! If you share anything on social media please use the hashtag #QuiltLikeABoss so that we can find your posts! This is just what I need to get me going!! I bought a magazine yesterday and have been watching crafts tutorials for a while but not made anything other than a zipper much and a patchwork peg bag!